Dust from furniture, lamps or electronic devices can leave behind unsi.. The Karcher VC5 HEPA Exhaust Filter (EN 1822:1998) reliably filters ev..
A special mattress nozzle for hygienic vacuuming of beds, mattresses, .. The fully redesigned, Karcher Extra Long Crevice Nozzle is now even na..
A High-performance, tear resistant 3-ply paper fleece filter bag for r.. The Karcher VC5 Cartridge Filter is a long-life filter that reliably f.. The Karcher Cartridge Filter is designed as a dust filter for Karcher .. The Karcher Plastic Suction Tube ID35 is a 0.5m practical extension tu.. 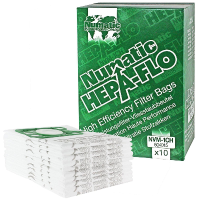 The Karcher Car Nozzle is a handy car vacuuming tool for maximum clean..
Numatic NVM-1CH Hepa-Flo Vacuum Filter Bags are a high-efficiency filt..